NEW! Buy the Two Trickster Tales digital audio book at our Bandcamp store! At the Bandcamp store, you can also buy the Cds, as well as print books and limited-edition prints, if you like. Pay with the convenience of Paypal. Audio book edition of Two Trickster Tales from Russia now available! The audio book edition of Two Trickster Tales from Russia is here now! It’s a wonderful creation from new start-up producer, Sounds Like Books: lively, funny, entertaining, with great incidental music and sound effects, and the complete text of the two stories in the book: Masha and the Bear and The Rooster with the Golden Crest. It is available on CD initially, and then later as a digital audio book. The CD features full colour print on the wraparound cover and the disc itself, and all information on the production. You can order it now, directly from us, or from our distributor, Dennis Jones and Associates. More info on the ‘Our Books’ page, including prices, and a great special we have on a wonderful pack, just right for Christmas, of print and audio book combined! Listen to samples of the audio book right here on our home page–to the left! Individual buyers, enquire at your local bookshop. 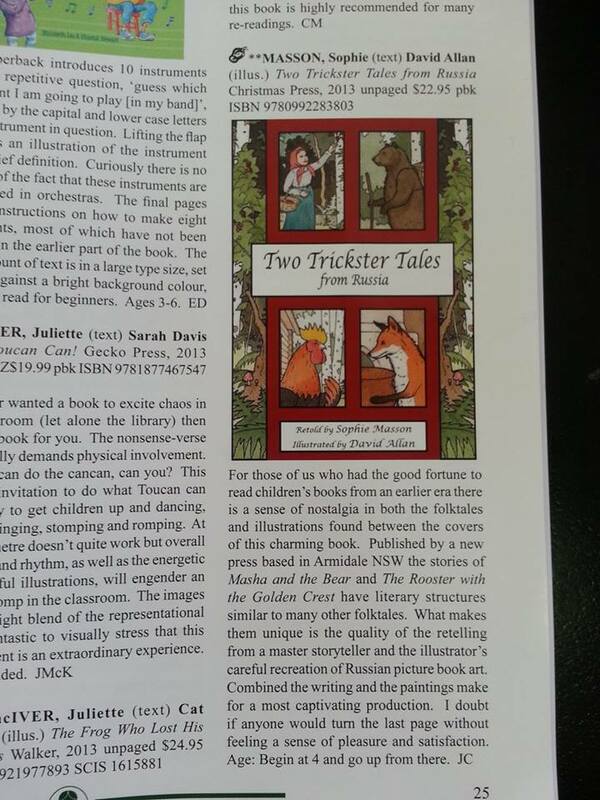 Thrilled about this lovely review of Two Trickster Tales from Russia in Reading Time, the magazine of the Children’s Book Council of Australia! Thrilled to announce two new titles for 2014! Very exciting news: we are thrilled to announce that we have now contracted two wonderful authors to write our next two titles, to appear in 2014! First,in May 2014, will be Two Selkie Stories from Scotland, hauntingly retold by Kate Forsyth, one of Australia’s best writers of fantasy for both adults and children. These magical stories of the beings who are seals in the sea and people on land will enthrall young readers and older ones alike. They will be gorgeously illustrated by Fiona McDonald. Second, in September 2014, will be Two Tales of Twins from Ancient Greece and Rome, in a wonderfully fresh and lively retelling by Ursula Dubosarsky, multi-award winning children’s author. The stories of twin gods Artemis and Apollo and the twin legendary founders of Rome, Romulus and Remus, will capture young readers’ imaginations and introduce them to Classical myth and legend in an enticing and exciting way. To be gorgeously illustrated by David Allan. For a limited time only, we have some great Christmas merchandise available for sale: Christmas cards and calendars. Order direct from us through the website order form, or contact us via Facebook. Christmas cards are $5.50 each, or a set of four, two with Masha and the Bear illustrations, two with Rooster and the Golden Crest illustrations, for $15, with postage/handling $5. Wall calendars(the green ones illustrated here) are $25, and desk calendars(the other illustrated here)are $20. Postage/handling on either is $7.